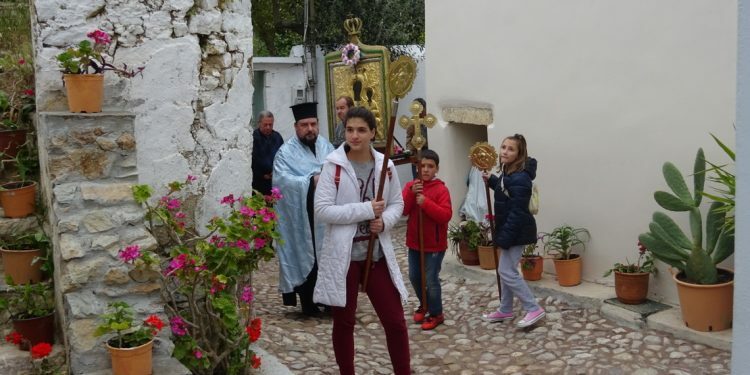 An especially important event for Kythera is the so called “Gira” (procession) of the icon of Panagia Myrtidiotissa which starts on the afternoon of Easter Monday. 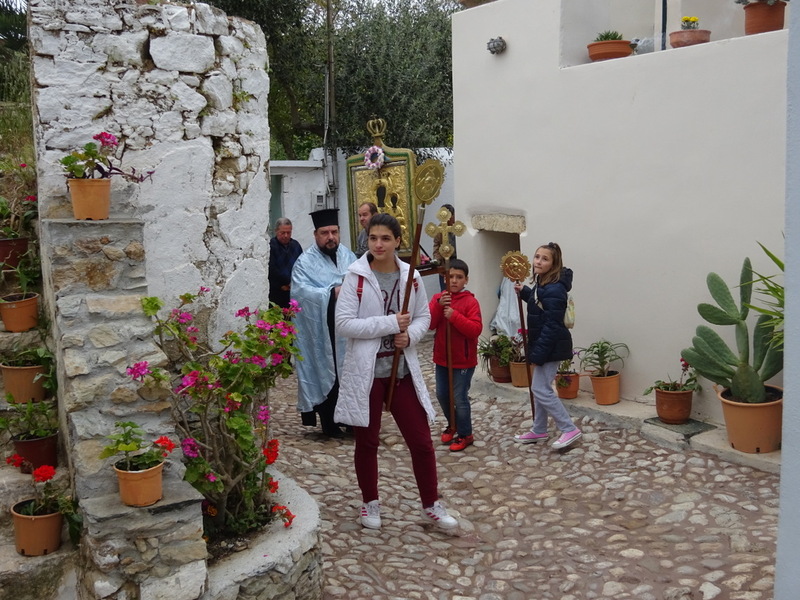 Leaving the church of Estavromenos (Crucified Christ) in Chora, the procession visits almost all the villages of Kythera. This is a very impressive event, with pilgrims carrying the icon and many more accompanying it on foot. 15 days later the icon is returned to its place at the Monastery of Myrtidia. This is one of the island’s oldest traditions dating back to 1750. Today, the icon left Potamos and was carried to Logothetianika. It is always very special to see the beautiful icon going through Potamos’ narrow alleys. Donderdag 20 april liep ik vanuit Aghia Pelagia richting Karavas de icoon tegemoet. Ik raakte in gesprek met een Griekse vrouw die ook de weg omhoog liep. Met weinig Griekse woorden begrepen we elkaar. Zodra de stoet in zicht kwam hoorden we Kyrie zingen. Zij ging zelfs nog de baar dragen. Tussen de Grieken mocht ik mee lopen naar Aghia Pelagia. Bijzondere ervaring dankzij informatie in het boek van Frank.